Over the years, friends have come and gone. Moved away, chose to walk away, disappeared, never to be heard from again. I am thankful for those that God has brought into my life, who have walked with me as I’ve weathered life’s storms. I have a community of friends that are tried and true, who have loved me through thick and thin. When my faith was weak, they’ve lended their own. When I could not see in front of me, they’ve brought sight to my blind eyes. When I felt as if I had failed, they’ve given back with nothing but unconditional love. And you, my on-line, may never meet in real life friend, thank you for being here. You inspire me to chase after my dreams. You encourage me by your grace-filled words. You have accepted me and given me unconditional love despite my flaws. Thank you for accepting me into your space. Thank you for sharing your life with me and allowing me to share mine in return. I would love for you to join me at Lisa-Jo’s place and share your thoughts on friendship. 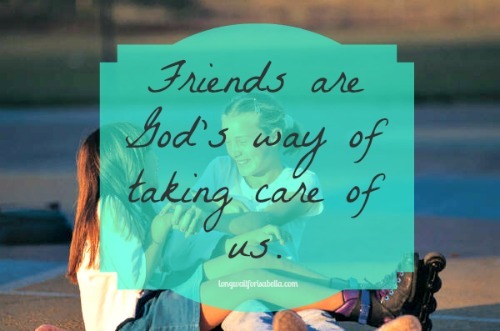 Yes, friends are God’s way of taking care of us!! Barbie, Thank you for how sweet and inviting you always are in #FMFParty. I was so nervous to join in my first part but you were there welcome others so it gave me the courage to just jump in. It was one of the best things I did. And this is why I blog. It’s true, we may never meet, but being a part of a community with women like you makes me feel incredibly grateful and blessed. This is exactly what I needed today. Thanks for uplifting me! Brie, so thankful you stopped by to read and be encouraged. That potato salad on your site today looks so good! Have a blessed weekend. And thank you for being my friend! :). You bless me! Thankful God brought you into my life! I agree with your words. You bless me friend!!! Thank you Alene! Have a lovely weekend! Oh Sweet Barbie… you are such a Light and a Joy to me! I treasure the friendship we have growing here… and I so wish I could join you at your (in)RL meet up! I will be busy with my own… but we will be together in spirit, friend! Oh girl, I wish we could be together at (in)RL too! But I am so excited you are hosting and I just know we will meet one day! Hugs! You have such a beautiful heart Barbie! Love what you’ve shared here today. I’ve been following you for only a short time, but I feel blessed already to know you in this online world. Thank you Beth! I look forward to getting to know you better. Barbie- in a few short months you have become one of my gems… thank you for you friendship! Oh girl, you brought a tear to my eye. Seriously. Just got done watching the IRL webcast and well, I’m mushy. Thank you for your friendship. I seriously hope we can meet one day! I love how you said A friend loves at all times. Very powerful. Thanks for stopping by Ashley! You’re a blessing! You are such a blessing Barbie. I am glad and honoured to walk by your side as a friend. Thank you my faithful friend. So thankful I got to meet you IRL! Hugs! Thankful for those friends who stick with us through thick and thin. I think perhaps I thought early in life that I would always have those friends plentiful in my life. But I’ve learned that God truly gives us a handful who stick like glue through the seasons and years. And they are gifts to cherish. Shelly- those that stick with you, I call them my diamonds. We have been made by pressure, forged from life and cut and polished into beautiful gems of friendship. Oh Lisa, I LOVE that! So true Shelly. Those kinds of friends are few and far between. Blessings! I figure that people come and go for a reason. I don’t question. It hurts when a friend walks away or when I have decided to walk away from a friend. Still, I know that there is a reason and that reason serves the greater good. Lovely post. Thank you. So true. I believe there are seasons in friendships. I do pray for those that will last a lifetime. Have a lovely weekend! That kind of friend is such a treasure. Have a lovely weekend Linda! Thank you Lizzy! I hope you have a great weekend. Thank YOU Barbie, for being an inspiration each and every week. I appreciate your friendship Megan! Blessings over you this weekend. You are sooooo welcome! 😉 I’m so glad to have you as a friend too!!! Awe, thanks Debi! Have a great weekend! Thank you, too. Love you, Barbie! Thanks for stopping by Leigh. Have a great weekend. I was trying to find the one bit I liked best. I can’t pick just one. Have enjoyed watching your conversations at the #FMFParty (I get a little braver each week – maybe next week I’ll dive in). This part: “When I felt as if I had failed, they’ve given back with nothing but unconditional love.” really resonates because I am all over that one. As I’m learning more about and exploring the online community, your closing paragraph rings true too! These friends – you – encourage, inspire, accept. Such a blessing. Thank you! Thank you so much Rebekah for stopping by! I hope you will plan to join the #fmfparty soon. It is a lot of fun. Hard for me to keep up with everyone, but so much fun. Looking forward to stopping by your blog. Have a blessed weekend!